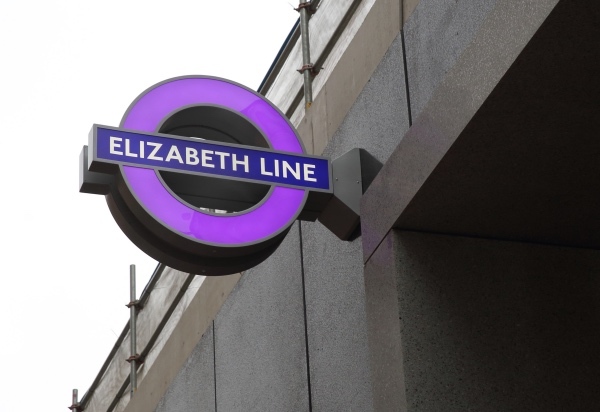 With just 11 months to go until the launch of London’s Elizabeth line, new purple roundels have been rolled out at stations including Tottenham Court Road (above), Farringdon and Custom House (below). They all feature the iconic Johnston typeface, first commissioned in 1913 and designed by Edward Johnston (with updates made in 2016). 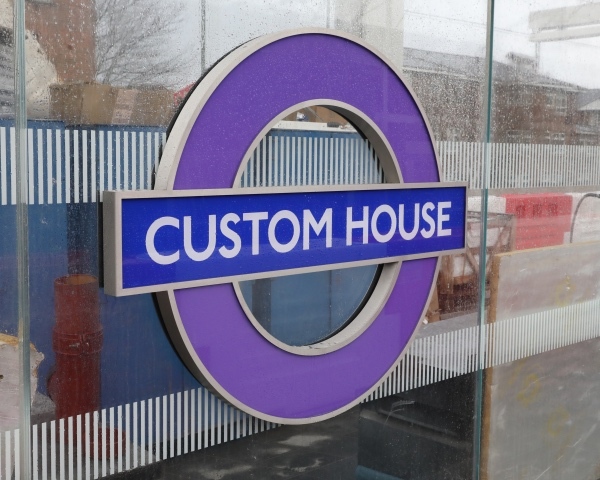 Construction of the Elizabeth line, being carried out by Crossrail Ltd, has now entered its final stages and the line will go live from December when 10 new state-of-the-art stations, all step-free, will open. 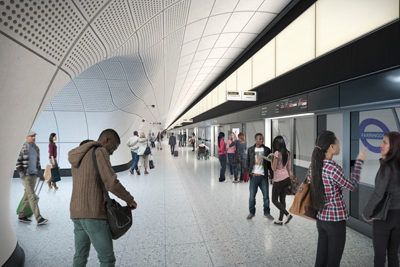 The line, which will enable a journey from Paddington to Canary Wharf in just 17 minutes, will initially offer three services: from Paddington (Elizabeth line station) to Abbey Wood via central London; from Paddington (mainline station) to Heathrow (Terminals 2 & 3 and 4); and, from Liverpool Street (mainline station) to Shenfield. The full route, which will run out to Reading in the east, opens in 2019. For more information on the line, see Transport for London’s page here. 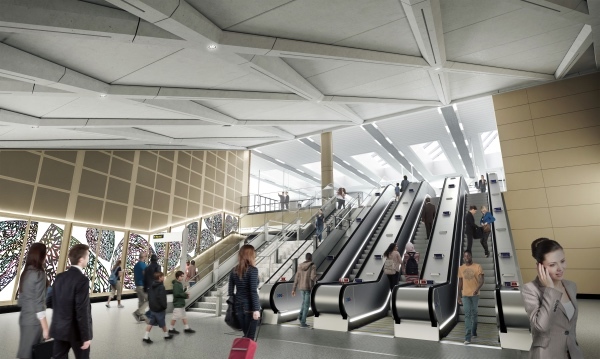 PICTURES: Courtesy of Crossrail: top – Monica Wells; below – James O Jenkins. 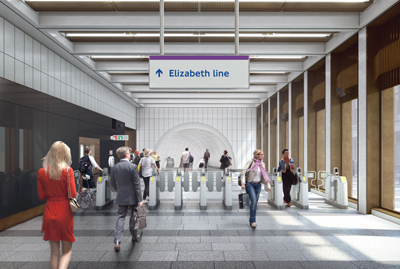 A new exhibition featuring designs for the 10 new Elizabeth line Underground stations has opened at the Royal Institute of British Architects (RIBA). 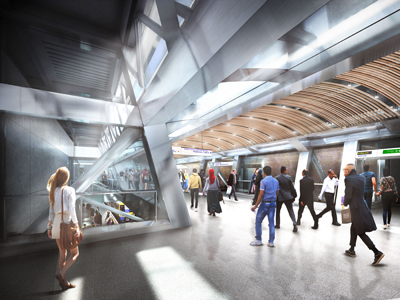 Platform for Design: Stations, Art and Public Space provides insights into the design of the new railway – part of the massive Crossrail project, its stations and public spaces which are slated to open in 2018. 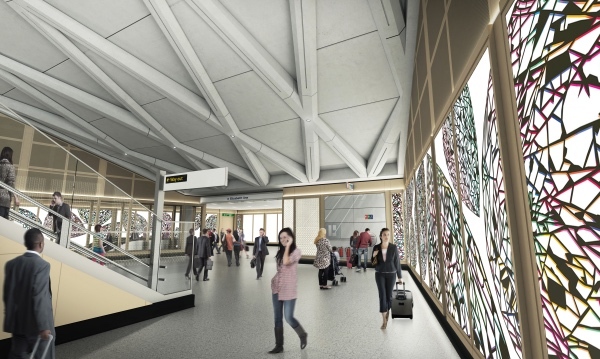 Each of the new stations will have their own distinct character designed to reflect the environment and heritage of the area in which they are located. 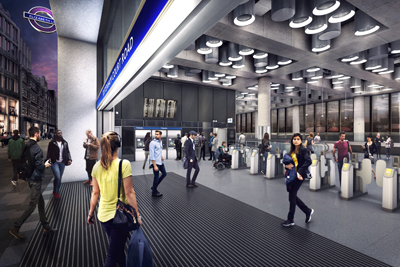 The new Elizabeth line station at Paddington, for example, is said to “echo the design legacy of Brunel’s existing terminal building” while the design of the new Farringdon station is inspired by the historic local blacksmith and goldsmith trades and the distinctive architecture of the Barbican. Many of the new stations will also featured permanent, integrated works of art design to create a “line-wide exhibition”. The Elizabeth line runs from Heathrow and Reading in the west across London to Abbey Wood and Shenfield. 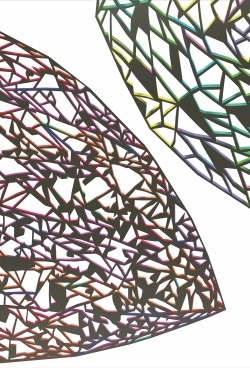 The exhibition at RIBA at 66 Portland Place in Marylebone runs until 14th June. Admission is free. For more on the exhibition, including the accompanying programme of events, see www.crossrail.co.uk/news/news-and-information-about-crossrail-events. There’s a couple of different suggestions as to how Bleeding Heart Yard – a small courtyard located in the Farringdon area of the City of London, just north of Ely Place – obtained its rather descriptive – and gory – name. The more prosaic answer is that it was named after an inn which, from the 16th century, stood on the yard and had a sign showing the heart of the Virgin Mary pierced by five swords. The more interesting answer, on the other hand, is that the name commemorates the horrible murder of Lady Elizabeth Hatton (of the famed Cecil family), second wife of Sir William Hatton (formerly known as Newport), and, after his death, wife of Sir Edward Coke. 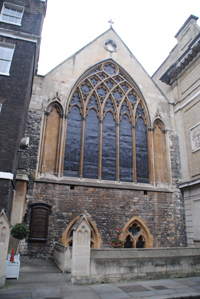 The story goes that her corpse was found here on 27th January, 1626, with the beating heart torn from the body. A version of the legend – albeit with a slightly different protagonist – appears in a story published in Bentley’s Miscellany in 1837 which told of how the wife of Sir Christopher Hatton (he was actually the uncle of Sir William Hatton), made a somewhat ill-conceived pact with the Devil to secure wealth, position and a mansion in Holborn. The Devil dances with her during the housewarming party at the new home and then tears out her heart, found beating in the yard the next morning. The yard also features in Charles Dickens’ Little Dorrit where it is the location of the home of the Plornish family. Farringdon is a name that crops up quite a bit in London. As well as Farringdon Road, Farringdon Street and Farringdon Lane, there’s a Tube/overground train station which also bear the name along with two of the 25 wards of the City of London. These latter are named Farringdon Within and Farringdon Without – a distinction which relates to their placement within and without the City’s walls and dates to the late 14th century. While the name Farringdon, which can be found elsewhere in England, apparently meant ‘ferny hill’ in Old English, its origins in London apparently relate to two medieval London goldsmiths, William de Faringdon (also spelt de Farindon and various other ways) and his son Nicholas. Both William and Sir Nicholas were aldermen and Lord Mayors of London in the late 13th and early 14th centuries. Sir Nicholas was apparently well favoured by King Edward II – he was several times appointed mayor, a job the king apparently said he could hold for “as long as it pleased him”. He was buried at St Peter-le-Chepe, destroyed in the Great Fire of London. Interestingly, another well-known alderman of this ward was the radical MP John Wilkes, who was elected while in Newgate Prison. Farringdon Street, which becomes Farringdon Road, runs along the course of the former Fleet River and dates from the 1730s when the river was arched over. In this, the year of the 150th anniversary of the creation of what we now know as the London Underground, it’s only fitting that we take a look at the city’s oldest Tube station – Baker Street. Opened on 10th January, 1863, by the Metropolitan Railway, the Grade II* listed property was designed by John Fowler, the company’s engineer in chief. 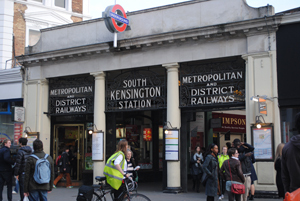 While some stations on the initial railway – which stretched from Paddington to Farringdon – had platforms located in open cuttings, Baker Street was one of only three initial stations (the other two were at what was then named Gower Street (now Euston Square) and Great Portland Street) which was genuinely located underground, with subterranean platforms covered by brick barrel-vaults and lit by gaslights as well as natural light brought from the surface by “lunettes”. The station was subsequently extended and further developed and, thanks to the company’s desire to make Baker Street its headquarters and “flagship” station, it underwent a major overhaul in 1911-13 with Charles Walter Clark, another Metropolitan Railway employee, designing a new grand booking hall and concourse featuring a lost property office, “ladies’ room” and a WH Smith bookstall. Features inside include a cast-iron screen – complete with clock – installed at the entrance to the lower concourse in 1925 to help control passenger flow during the British Empire Exhibition at Wembley, a marble memorial to Metropolitan Railway employees who died in World War I, and, in a nod to the proximity of his fictitious Baker Street residence, large and small Sherlock Holmes silhouettes on tiles located at various places inside (there’s a statue of him outside the station). For more on the 150th anniversary, see www.tfl.gov.uk/tube150. A lost London burial ground has been unearthed in Farringdon by archaeologists working on the £14.8 million Crossrail project. Thirteen adult skeletons, believed to be up to 660 years old, have been discovered lying in two rows 2.5 metres below the ground on the edge of Charterhouse Square. It is likely based on the depth at which the bodies were buried and other evidence (including pottery found at the site and a similarity between the layout of the bones and those of 14th century plaque victims unearthed at the East Smithfield Burial Ground in the 1980s), that the skeletons were buried here in 1349 during the Black Death. Historical records suggest that as many as 50,000 people may have been buried here in the three years from the burial ground’s opening in 1348. The burial ground remained in use until the 1500s but has never been located in modern times. The skeletons are being excavated and taken to the Museum of London Archaeology for laboratory testing. Crossrail Lead Archaeologist Jay Carver described the discovery as “highly significant”. “We will be undertaking scientific tests on the skeletons over the coming months to establish their cause of death, whether they were Plague victims from the 14th Century or later London residents, how old they were and perhaps evidence of who they were,” he said. It is likely more remains will be found according to experts. 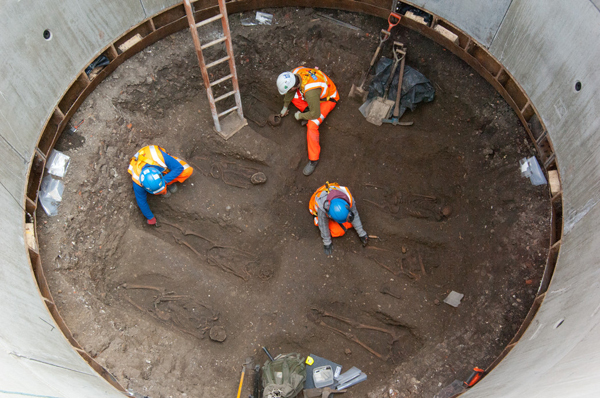 Archaeologists working on the Crossrail project have previously uncovered more than 300 burials at the New Cemetery near the site of the Bedlam Hospital at Liverpool Street from the 1500s to 1700s. For more on Crossrail, see www.crossrail.co.uk.